Finally an outfit worth posting. Lately I've been more likely to wear leggings and sweaters, but today I pulled out a dark shirt dress with cute mini radishes printed on it. It must be all these fall collections that are making me want to wear all of my favorite autumn clothes. 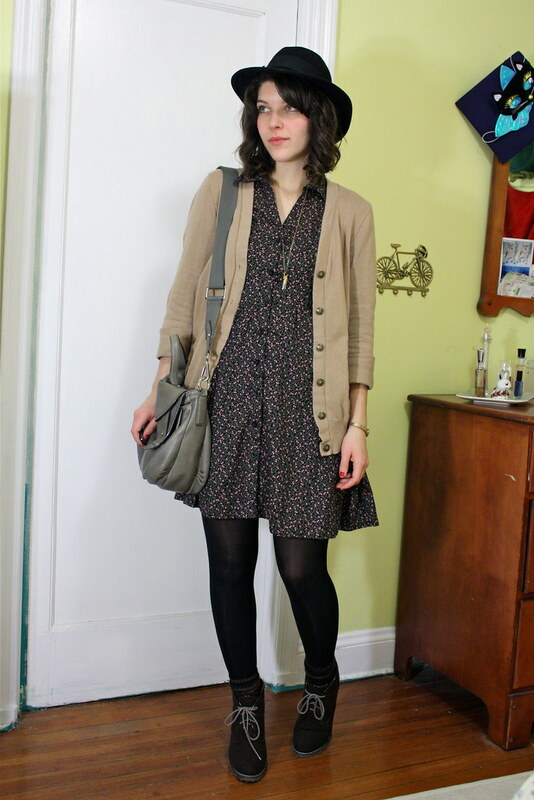 I wore this to work and out for lunch at a cute place in Tribeca called Love & Peace on Moore and Greenwich streets. Oh! I almost forgot to tell you, but this was the last Monday at my job. Soon I am going to be starting something new in Manhattan! Very cute! The hat pulls everything together nicely. Congrats on the new job! supper cute outfit, i love it! So cute - I love the addition of the hat! Good luck with the new job, love the outfit especially with the hat. ohh, what will the new job be? Congrats on the switch! 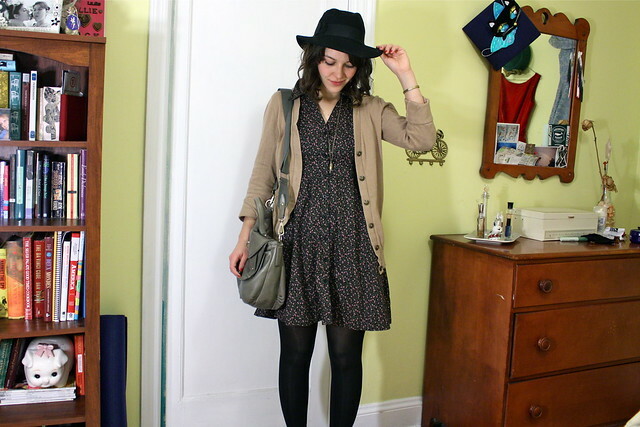 Also, I feel like I could live in this outfit. The dress and the shoes are too good. Good luck in your new job. And Happy V Day! A new job?! How exciting!! I love your little radish dress...the outfit certainly does have a fun, fall feel to it. That looks like my kind of outfit. I've been feeling a lot of leggings and sweaters lately. Congrats on the new job, you lucky duck! That hat is awesome. It reminds me of one I have and also reminds me that I need to wear mine! 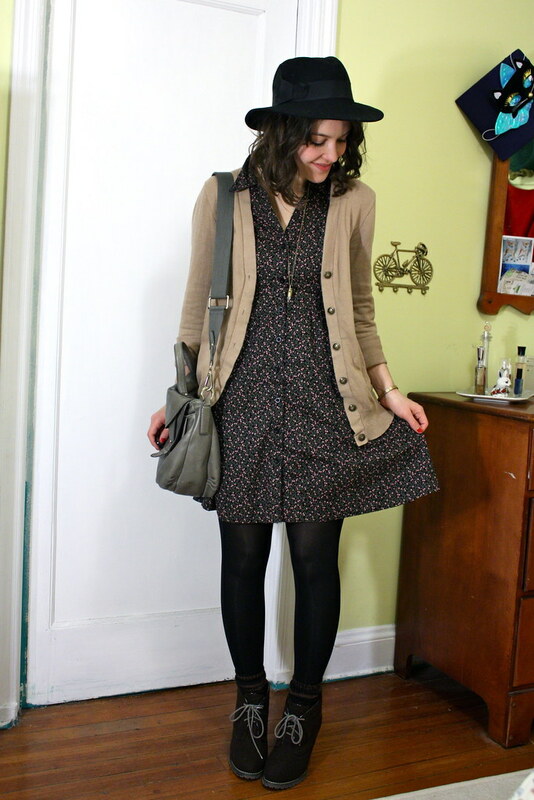 I love it with your cute dress, cardigan, and fantastic boots. ooo i love this post! i like how it's inside and still a GREAT shot! how did you manage that?! a really light room? i loooove the bicycle key chain holder in the background.